When we first met Sally and Matt, we never imagined that their wedding was going to be this visually exquisite. As a Boston Wedding Photographer, we are lucky to have clients like them. Sally was so low-key about the whole process and when I asked her how she did it, she responded, “Oh, I know, everything just fell into place. And it seemed like for every detail, vendor, or staff we got more than we expected. “ Like magic. Yeah, that’s pretty much how we feel about them- they are the magical Boston couple.And to top it off, Matt sang “Shook me all night long” by ACDC. Hilarious! Love the picture of the dinner menu; an amazing picture of an ordinary wedding event. They may be magical couple- but you are magical photographer as well. 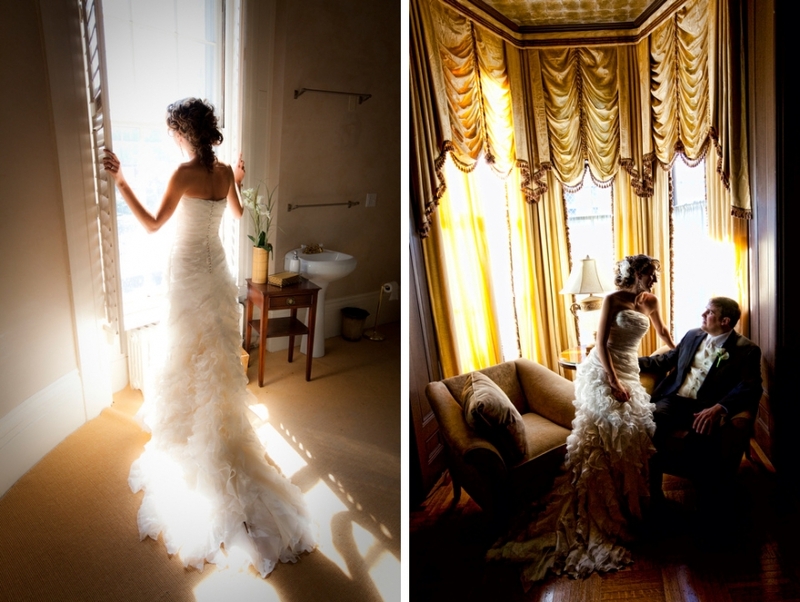 I very much love the light in the bridal suite photographs,and I also very much enjoy the shot of the bouquet. thank you for sharing. I am finding this website to be educational and addictive, so many talented photographers all in one spot! Love the aerial stairwell shot and the black and white Gothic Church. It looks a lot like the St Joseph Cathedral in Columbus, Oh, where we had our ceremony. @ Mariquita: Some of the credit, especially for the bridal suite shots go to our stellar associate photographer, Chris Gagne. He does an awesome job and very much embodies our style and philosophy. We photograph every wedding with two photographers and find this very much frees us up to really stretch ourselves and push the envelope a bit–basically we can take many more chances–high reward with a much lower risk. @ Lauren: Church in Charlestown, Mass was amazing to say the least. It is easy when you have such a spectacular place in which to make photographs. About the stairwell shots – we went above to give the sense of depth but more importantly was the use of black and white really helped these scenes since that carpet it red and competed too much with our subjects. Color is a godsend and a curse all at once. A true PJ master might be Alex Webb. Google him because I think you will appreciate his work. Great work and what an amazing venue. Beautiful images, lighting, and angles! You were able to capture not just pictures, but also the moment and the emotions around it. I’m sure they were thrilled with all the shots, and they definitely have an album that isn’t like anyone else’s. Kudos! Spectacular … the church was an amazing setting. Love Your Work! Gorgeous photos and use of natural lighting. Stunning … you managed to capture all the emotions of the day. What a gorgeous bride and what a beautiful church! Love the shot of the bride dancing — so natural — you captured her happiness and fun personality. Love the black and white ones – they always look priceless. Great gallery – natural and classy. I am sure the couple loved them.